Timothy is no longer getting his nourishment from an IV. He has made enough progress passing his ‘food’, and is gaining weight and looks very healthy. 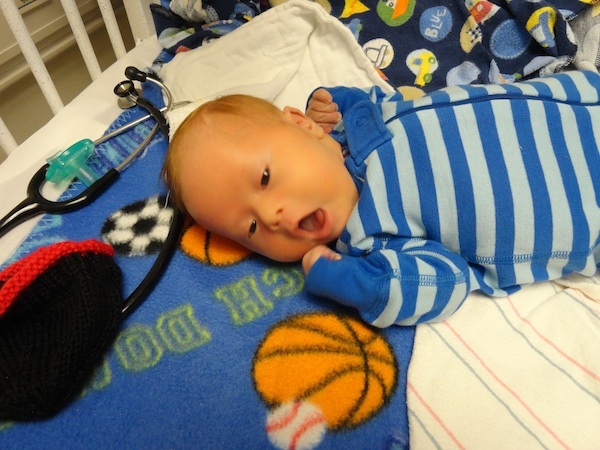 As a result, he was moved up from Intensive care (NICU) to the Infant Care Center (ICC), which is the on deck circle before he gets to go home. This is a big step! I realized that I had probably broken some code of brothers by not giving the lad a heads up beforehand about the procedure. TRBL was a little cold toward me when I saw him later in the day, and I have reason to believe that when he spit up on Grandma GG, he was aiming for me. But we hugged it out before he napped and I think we’re cool. So he is now eating mostly through a feeding tube, and is beginning to work on taking a bottle and also breastfeeding, which will allow us all to go home. But getting this kid to come home may not be easy. He may weigh less than a rotisserie chicken, but he’s no dummy. Timo realizes that when he leaves Children’s, he’ll be trading in a Westin for a Days Inn, trading round the clock world class medical care for a couple of out of practice old parents and two teenagers. But seriously, the nurses tell us that eating is a very complex set of actions, and he spent his first nine days where he got used to not doing anything to get fed. But that needs to change, and Laura is working very hard to teach little man to eat so he can exit the hospital. We’re beginning to hear more people say, ‘Well, since he has Downs, he’ll have trouble with X or Y”. There may be truth in much of what they are saying, but it chafes us to hear him being put in a box and tossed into his disability before he’s even left his hospital bassinet. It’s a reminder that it will be a lifelong fight for him, and for us, just as it is everyday for anyone with a disability or challenge. You can’t help but be floored by the stories of hope here from Children’s hospital, from the kids with cancer or babies born prematurely. The staff and these families and kids amaze us and it all reinforces our own good fortune. And we’re also inspired by and draw hope from our own tiny Timothy, who is already jumping through hoops and teaching us much, even after just the first week of school.